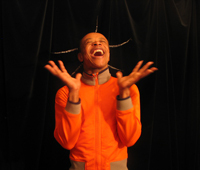 The Company was started in 2001 by Merlin Nyakam, a fabulous dancer (also nicknamed Merlin the Enchanter) from Cameron who had danced with the National Ballet of Cameroon and Compagnie Montalvo-Hervieu in France. The company’s first two works, Recreation Primitive followed in 2004 by Liberte d’Expression, are both afro-contemporary works exploring ethnicity, tradition versus modernity, living under the others eyes, and internal freedom searched and feared in the same time. These works have been presented on numerous prestigious stages in Paris, throughout France and Europe and, since 2007 in Japan on an annual basis (see partial list below). 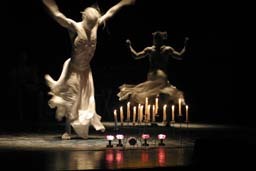 La CALEBASSE’s dancers and musicians include members from Cameroon, Ivory Coast, Burkina Faso, Guinea and France, creating links and complicity making each performer show different parts of their personalities and talents to enhance each performance and enrich the Company’s life. Each member works with other artists, but also has the maturity and talent to begin and continue cultivating their own personal path. Concerts, new albums and solos are being created with our artists as leaders, revealing and improving day after day and celebrating the diversity from outside influences, roots and directions that have mixed with the company. Merlin Nyakam has succeeded in infusing these individuals with a common energy and creativity surrounding his own work made from African spontaneity and false naivety, while offering a path or a question, rather than imposing a judgment. Merlin’s works are made from mastering technique, which have increased his charisma and have drawn attention from numerous professionals, having also attracted an audience, captivating and initiating them to dance in general and ballet in particular. Theatre National de Chaillot and Opera Bastille (Paris), Theatre Gerard Philippe in St Denis (France), Bordeaux Opera House, Theatre Toursky (Marseille), Fabrik Postdam (Germany), Spring Art Festival Shizuoka (Japan), Park Theater Eindhoven (NL) Queen Elizabeth Hall (London), Teatro Nuovo of Turin (Italy), Centro Cultural Villa de Madrid (Spain), Teatro Liceo of Salamanca (Spain), Maison de la Culture de Tournai (Belgium), Dansen Hus of Stockholm and nationwide tour of Sweden, Madrid en Danza Festival (Spain). In March 09, La CALEBASSE made its US debut to high critical acclaim at University of Washington's UW World Series at Meany Hall in Seattle with a week engagement of Recreation Primitive.